West Jefferson Blvd, 1932. All that’s missing from this photo is Edward G. Robinson and an arsenal of tommy-guns. 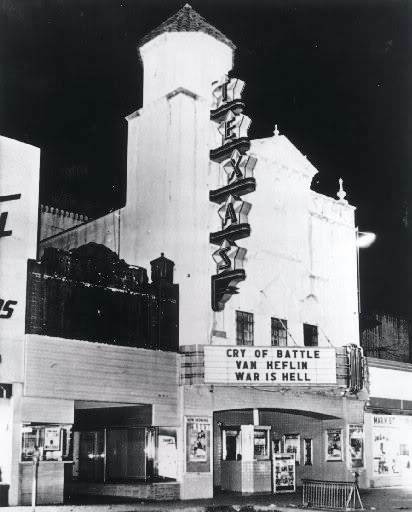 This is the only theater in the world whose marquee showing the 1963 double feature of “Cry of Battle”/”War Is Hell” has become a part of history (the Texas Theatre, is of course, where Lee Harvey Oswald was captured on the afternoon of November 22, 1963). When the movie theater opened in 1931 — in the time of Prohibition and running boards — it was a much more elegant-looking picture palace. Had he not been in the Big House at the time, John Dillinger might have seen this very same Gable and Harlow movie at the Biograph (or what I call “Chicago’s Texas Theatre”). He probably wouldn’t have been sitting through something called “Kiddie Frolics,” featuring Oak Cliff’s own Virginia Self, a teenage dancer … frolicking. After several changes in ownership and a few awkward renovations, the Texas Theatre seems to be back on track these days. The history page of their website is here (with interesting factoids such as: it opened on San Jacinto Day, it was the first theater in Dallas with air-conditioning, and it was briefly owned by Howard Hughes). For photos of the theater’s interior, published in 1932 in the trade journal Motion Picture Herald, see my post “The Texas Theatre and Its Venetian-Inspired Decor,” here.